For a lot of fathers, the Sunday of Father’s Day means taking time to be away from the kids to play golf. This, I find, is more than a littte sad. Of all the loves I had before kids, golf was probably the hardest to give up in order to spend time with my family, but I’ve never mourned it enough to spend more than a few Sundays away. Six to eight hours out of a weekend was something I could no longer afford to be without even in the pursuit of par. Still, golf is very connected to fatherhood in my own life. My own father was gone about 100% of my childhood years, having moved away when I was about 4 years old. We only really got a chance to connect on the golf course after I had reached adulthood. So, for me, I’d rather see golf connected to involved fatherhood. As for now, I’m still waiting patiently for my 7-year old to pick up the game. For the golfing dad in your life, here are four golf books I’ve enjoyed that make for good gifts for dad. 1. Golf Dreams – John Updike, the great chronicler of late 20th century American life, was a life-long hacker. He was a tall man and I’m sure he could stroker the ball well, yet had the same yips and slices of the rest of us. Golf Dreams is a collection of stories, extracts (from the Rabbit series), and essays, many from the New Yorker. They can be read in pieces or as a collection and make a fine prize for any dad who enjoys golf, and a well-turned phrase. 2. Moment of Glory – John Feinstein, best-selling author and frequent NPR contributor catalogs the golf year 2003 when Tiger lost his swing and four relative unknowns won each of the majors. Mike Weir won the Masters, Jim Furyk won the US Open, Ben Curtis won the British Open, and Shaun Micheel took the PGA. Feinstein is a fantastic sports writer and for any golf fan who lived that year (the year he stayed home to help with the baby? ), it’s a good read. 3. 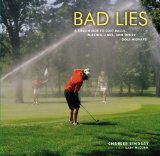 Bad Lies – Bad Lies is a “Field Guide to lost balls, missing links, and other golf mishaps.” It’s a coffee table-style book with glossy photos of all the horrible things that happen on the course and the funny names that have been given to them, from Zinger to Dunch to Mulligan. This is a fun book to page through with a Heineken in one hand and the TV remote in the other. All golfers will enjoy the photos and humor. 4. Golf with Dad – David Barrett wrote this collection of the stories of fourteen tour pros, and the role golf played in their relationships with their fathers. From Phil to Jack to Arnie (Tiger is conspicuously absent), there are heartwarming stories aplenty. Barrett is a pro golf writer so has the chops to write both an accurate and inspiring collection of tales. You can’t find a better title for a book for a golfing dad. All these books make for perfect gifts, especially if inscribed appropriately and given at the 19th hole. For a lot of fathers, the Sunday of Father’s Day means taking time to be away from the kids to play golf. This, I find, is more than a litte sad. Of all the loves I had before kids, golf was probably the hardest to give up in order to spend time with my family, but I’ve never mourned it enough to spend more than a few Sundays away. Six to eight hours out of a weekend was something I could no longer afford to be without even in the pursuit of par.